Rajendra Pachauri, the chairman of the Intergovernmental Panel on Climate Change (IPCC), is a non-stop train wreck. The IPCC is supposed to be an objective scientific body, but Pachauri writes forewords for Greenpeace publications and has accepted a ‘green crusader’ award. He is an aggressive policy advocate even though his organization is supposed to be policy neutral. In 1996, an Indian High Court concluded that he’d “suppressed material facts” and “sworn to false affidavits.” Contrary to longstanding claims, he earned only one PhD rather than two. This book is a collection of essays about Pachauri originally published as blog posts between February 2010 and August 2013. Essay number one, The IPCC and the Peace Prize, appears here for the first time. It documents how Pachauri improperly advised IPCC personnel that they were Nobel laureates after that organization was awarded half of the 2007 Nobel Peace Prize (Al Gore received the other half). Scientists aren’t supposed to embellish. They’re supposed to be clear-eyed about what is true and what is false. The idea that hundreds of scientists have been padding their resumés, that they’ve been walking around in broad daylight improperly claiming to be Nobel laureates, isn’t something any normal person would expect. But that is exactly what happened. It took the IPCC five years to correct the record. During that time, media outlets, science academies, and government officials went along for the ride. The moral of this story is that, when faced with a choice between the unadorned truth and exaggeration, IPCC personnel made the wrong call. Their judgment can’t be trusted. This book is available in three formats. An iPad and printer-friendly PDF is here. The Kindle e-book is here. The paperback is here. If you value the kind of journalism I’ve spent the past few years undertaking please, please buy this book. Like everyone else, I have bills to pay. 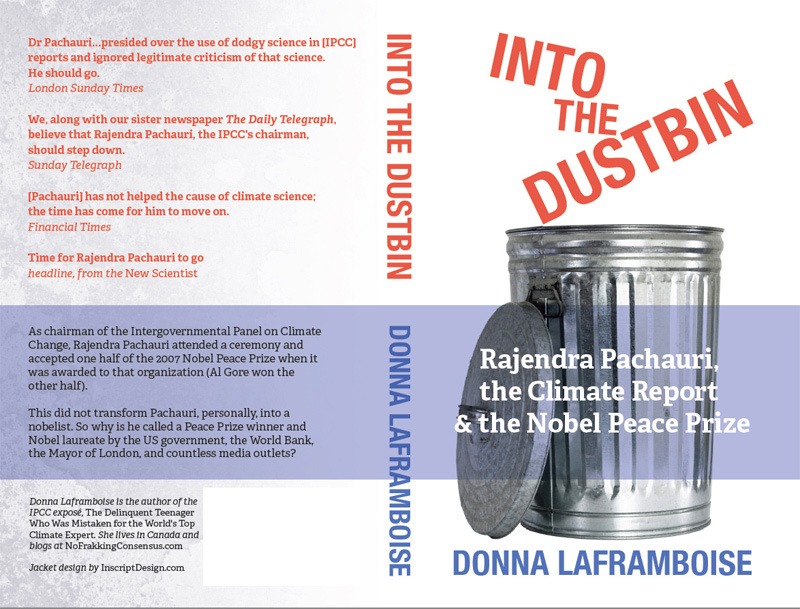 This entry was posted on September 10, 2013 by Donna Laframboise in books, IPCC, Rajendra Pachauri and tagged Intergovernmental Panel on Climate Change, Into the Dustbin (book), IPCC, Rajendra Pachauri.